An elderly man is dead and at least six others injured in a horrible road traffic accident this morning. It happened in the Savannah area about two miles from the junction with the Southern Highway. 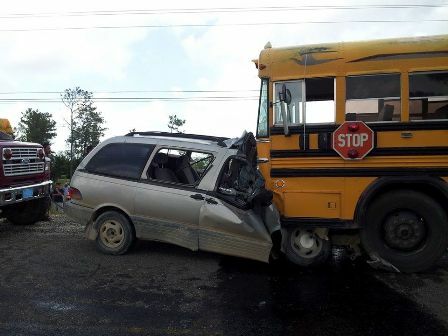 At around seven fifteen am a school bus was heading to Independence High School carrying new first form students for orientation, when a grey mini-van driven by seventy-one year old William Alexander Anderson crashed head-on into it. Anderson, a businessman of Monkey River, was killed on impact. News Five has been reliably informed that at least six students and a teacher received minor injuries. Police sources tell us that the bus was in its lane and the van swerved into it. At this time it is not known what caused Anderson to lose control of the vehicle, and Police do not wish to speculate until the results of a post-mortem examination are in. There was also an accident on the George Price Highway early this morning. It happened near miles forty-seven when a Valencia passenger bus and a motorcycle collided. Only four persons sustained minor injuries.